Written by Dan Johnson on July 24, 2014 Blog. If you’re a Sensei user, you have probably experienced that buzz of satisfaction when a new customer starts taking one of your lovingly crafted courses, followed by the thrill of seeing them work their way through the course. You may then have experienced the sense of disappointment, when that student completes the course and disappears, never to be heard from again, despite all the other great courses you have to offer. So, what can you do to keep your students coming back for more? Follow Up Emails is a WooCommerce extension, which is used to send scheduled emails to customers based on certain actions they take on your website. It also works perfectly with Sensei however, which makes it invaluable for keeping in touch with your students after they have finished taking your courses. Your email can congratulate them on their effort, and thank them for their custom. Best of all, you can set it up so a coupon code is included in the email, so you could offer a 10% discount on any other course, for example. 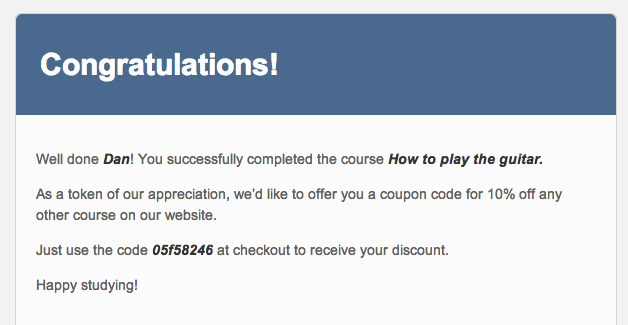 After completing one of your courses, your student will receive the email, along with the discount code, making it much more likely that they’ll take another look at your courses, to see how they could make use of their coupon. The email text can be customised to your liking. There are countless ways you can make use of Follow Up Emails alongside your Sensei website. You could use it to send out a link to a customer feedback survey after course completion, so your students can let you know what you could do to improve your course. Some courses may require regular reassessment, say every year, so you could send out an email 11 months after course completion, reminding them that they are due to take the course again soon. Or you can simply use it to keep in touch with past students, perhaps sending an email a few months after they finish a course, to ask them how they’re putting their knowledge to good use, and perhaps mentioning any new courses you may have developed in the meantime. We’d love to hear about any interesting ways you’re using Follow Up Emails to keep in touch with your students. Let us know in the comments. Nice write-up Dan. Love seeing Follow Up Emails get special attention. It’s a great extension! I love the flexibility it provides in creating custom schedules and that it supports all the important events in Sensei and other plugins. A very powerful tool for any educator’s (or store manager’s) utility belt. Thanks for the write up Dan, going to give this a try soon. And I really think custom status’ should get a whole lot of love from the Woo-team. Because the custom status plugin in the WordPress repository is in dire need of an update. And the developer doesn’t answer tweets and support questions. – I have a couple of times (starting over a year ago) asked Scott from 75nineteen media to implement the ability to deeplink to the review form. It’s just adding this #review_form to the product URL. At first little over a year ago he was open to the suggestion. But now he has stopped answering me 🙁 I think this is an essential part of getting people to review the products they’ve bought. – After the plugin was made into a flow, the plugin was complicated to me. If I have to fix a little thing, I have a bunch of click to get into it. And I don’t necessarily know what I’ve filled out in the following points. The decision to make the plugin into a flow is a usability nightmare in my opinion. Please reconsider and make it a one-pager again. – I don’t like the fact, that this plugin has a top-level navigation point (this was implemented the same time as the flow), before it was under the WooCommerce tab. I can of course see the meaning of this when the plugin starts to be used for other than WooCommerce. Even though I have these gripes with the plugin, I still recommend it to anyone wanting to get closer to their customers. Because it’s a good way to make a one2many communication feel like one2one communication. We do thank you for being one of the most loyal customers! We have not forgotten about you. Even though it is simple, we just simply didn’t prioritize it. Something else seems to always get in the way. We will get it in there for you though. Regarding the navigation – yes, this is because you can now use Followup Emails without WooCommerce even installed. If you want to use it and you ONLY have Sensei, you can do it. This decoupling made that possible. It is still an important part of WooCommerce. We are trying to make WooCommerce communication easier! We are building in many more CRM tools as our users are becoming much more advanced! As far as the multi-step, we kind of like it, but understand completely that it might cause more effort when you are editing – what if you could choose which step you could go back to when you need to edit? The cool thing about multi-step process is that you can start creating the email, and stop part way through… it will save your email and it will not be active, so you can come back at any time to finish your process. Store owners are busy, and we felt this would be helpful when considering the creation process. Ultimately, our focus is on you. Keep the ideas coming! I appreciate you taking the time to answer my comment. Regarding the flow (multistep) vs. onepager. Couldn’t you just save a draft if the biggest argument is, that we the storeowners are busy? I mean when something as complex as a WooCommerce product can be as a onepager then the follow up email plugin should be able too as well. Just imagine if you had to create (and even worse edit) a product in multiple steps. 8-/ In any case, this would be the easiest question to ask your users in a poll. And the answer would give you a good understanding of how your users use your plugin. If this plugin could be developed a bit more in line with what aweber / getresponse have to offer I would not hesitate purchasing it for five times the price! But I’ve bought this extension before and it was sub-par (and that is me being nice). What is to say that it won’t be another disappointment? The GUI was terrible and there were too many bugs then. That probably has something to do with the fact that it is developed by someone else, but branded as woo. In my honest opinion, it feels a bit like a half-baked effort for something that has the potential to be truly amazing. I also prefer non-woocommerce email branding (just plain text) to make it feel more like a personal email. Whilst customers know that’s not the case, it still makes it much of a better experience for them. Finally, the product page of this extension is also really bad; no demo of the (new) functionality… nothing. The email you sent inspired me to check it out again for a moment, until I’ve come to the conclusion that it’s probably still same old same old. And that’s not a good thing. Sorry. We have been meaning to make demo videos. Check out the changelog: http://dzv365zjfbd8v.cloudfront.net/changelogs/woocommerce-follow-up-emails/changelog.txt and you can see what has changed. We do agree that earlier on the plugin was buggy, but we also never expected the uses that creative store owners would want to try using it for. We are humbled by that. We are always looking for beta testers, and more integrations with additional WooCommerce plugins! We invite you to try the plugin again! I really Like your ways showing about “Introducing Follow Up Emails”. Because it show us how to schedule sent Email, Generate & Send a Coupon Code. Thank Woo Themes!